Anyway, here are some more squares for Georgia's Palmetto fund raiser. The upper left leaf is the 1975 Workbasket Maple Leaf, corrected and diagrammed by Tammy Rodgers. Click HERE for a pdf pattern. The lower right leaf is the Light and Ayr Maple Leaf, by Karey Solomon, from Tatting Times November 2007, and on the Tatting Times CD. Do you know if it is also in her book, "Tatting Turns over a New Leaf"? I've been thinking I need that one. The other leaves are my simplified variations. 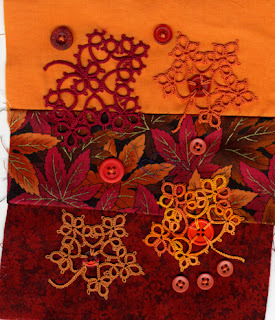 This one has some leaves from Ruth Scharf's patterns. 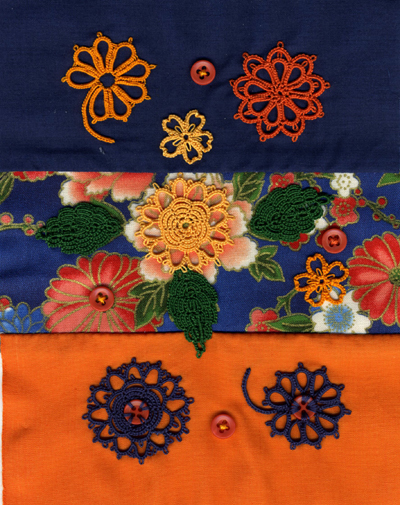 The flowers are classic motifs or freestyle tatting.